Congratulations to Timothy Clayton of the Hickory Tavern Community. Tim had the closest prediction to the actual moment of the first time the temperature at the Laurens County Airport hit 32.0 degrees………officially freezing. Participants were able to register predictions of the first freeze by qualifying through an on air contest with WLBG or by visiting select merchants who are Main Street Laurens members. 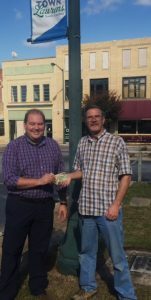 As the winner of the WLBG/Main Street Laurens First Freeze Contest Mr. Clayton was awarded the $86 cash prize by Jonathan Irick of Main Street Laurens. By the way, Tim’s prediction for the first freeze was October 30th at 6:08AM. The actual first freeze occurred on October 30th at 7:15AM. He didn’t predict the exact time but was only 1 hour and 7 minutes off and was the closes prediction to the actual time.